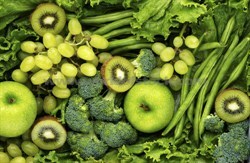 March is Green Month, as the menu features several fruits and vegetables that are green. In this month's newsletter, read about Mediterranean Cuisine, traditional Irish fare and information about hydration. In addition to reading the newsletter, download this month's exciting menus or view our online catering menus at the Food Services Web Site. Now is a great time to encourage your kids to choose school lunch and breakfast. In the past couple years, SEL became the first district in Northeast Ohio to implement the Farm to Fork program, bring fresh local produce into the cafeterias. SEL has also implemented breakfast in the classroom for grades K-8, which has increased breakfast participation across the district by over 200%. The equipment required for both of these programs have been fully funded with over $40,000 in grants over the past two years.